Physics from the edge: Bozeman, Montana or TU-Dresden? OK, I'm willing to be the goat: What about Bozeman? MikeNYC: Good question. See Star Trek: First Contact. Hi can you define/describe what you mean by monochromatic waves? Do you have any references in your other papers? Most of the Unruh radiation descriptions talk about regaular electromagnetic waves. Do these stargate have anything to do with Hutchison's research? The attached link shows QI as an energy level that is related to your time energy uncertainty principle description and shows how inertia is an entropic force. http://arxiv.org/abs/1801.10018 It's a short paper and doesn't set any constants equal to one. Of course they don't mention QI but they quickly notice that their entropy can only go the wrong way for a short time. Loved the beer story. Bozeman. Need to have the launch site correct when prototype construction begins. It turns out we have been measuring absorbed and reemitted Unruh radiation since the 1970s and calling it Sokolov–Ternov radiation . This is inelastic scattering of Unruh radiation onto the mass shell and supports the idea that inertia is an entropic four-dimensional force . And the asymmetric Casimir force is recovered in three-dimensions after the inelastic scattering onto the mass shell as shown by Equation (10) in . This requires replacing the Rindler event horizon with its static limit. The static limit blocks the distant universe from interacting with the accelerated electron in circular motion because the distant universe would have to rotate faster than light in order to do so. The static limit is almost as far away as the event horizon was before it disappeared due to the circular motion of the electron and from Appendix C “Unruh Radiation” in your book “Physics From The Edge” we see that delta x from Heisenberg’s uncertainty principle still enables the Unruh radiation to arrive here in a timely fashion. It’s interesting to note that the acceleration of storage ring electrons is on the same order as electrons on the gold nanotips described in “Physics From The Edge” on page 38. The rationale of this claim is that remainings of a dwarf galaxy that once collided with ours are coming closer and according to common wisdom, these should be accompanied by 10 trillion sun masses of dark matter. Continuing from yesterday. For black holes the event horizon of a non-rotating Schwarzschild black hole and the static limit at the equator of a rotating Kerr black hole are at the same radius 2m(G/c2), so we could continue to use r=c2/a, Equation 2.12 in “Physics From The Edge”. Both the Schwarzschild event horizon and the Kerr static limit are infinite redshift surfaces and that’s how both linear and circular accelerations work for detecting Unruh radiation. The static limit and infinite red shift surface for an electron in circular motion is elliptical because of Lorentz contraction along the electron’s direction of motion, which should prove useful for “warp” core design. Matt Visser’s paper “Conservative entropic forces” describes the many problems we will be facing trying to mimic gravity using quantum (your quantised inertia) entropic inertia. Two pies are better than one on Thanksgiving. Happy Thanksgiving. Erik Verlinde postulates that an extra 2 pie is required in Equation (3.5) in  in order to get the correct answer. Like you put in the extra 2 pie in Appendix C “Unruh Radiation” to get the correct answer. Matt Visser says, in yesterday’s reference, that we need to stack the Unruh temperatures in order to mimic gravity. Ok, the electromagnetic (em) drive does this stacking nicely by making one end wider than the other. So, all? we need to do is put those virtual Unruh photons in the em drive onto the mass shell. And the virtual photons in QED increase the mass of their absorbers by E/c2 and are reemitted on shell, taking that mass increase with them. A boundary condition on quantised inertia. Inertial mass = mass (1 – 2c2/a theta) = zero if a = c2/r and theta = 2r. 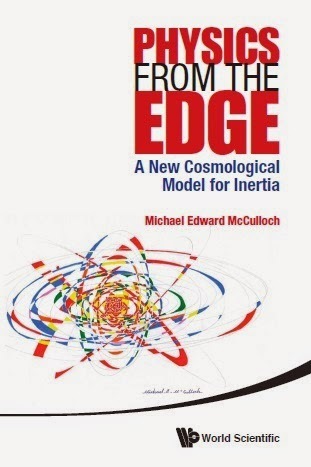 And can be under stood as engineering a Rindler event horizon and hiding inside it… To conserve momentum the electromagnetic (em) drive accelerates slowly towards its narrow end. Anxiously awaiting news: now they're inventing 'dark fluids'! Next will be 'dark butterflies and rainbows'...where will the madness stop?